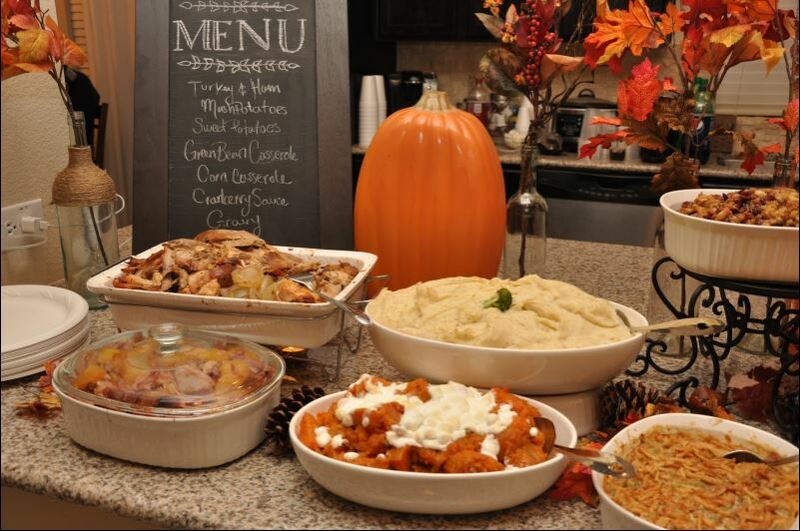 Think your apartment home isn’t ideal for hosting a successful Thanksgiving dinner? Think again! 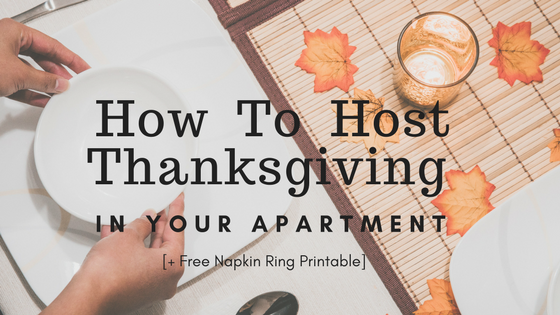 In this post, you’ll learn how to throw the perfect Thanksgiving dinner gathering in your apartment. 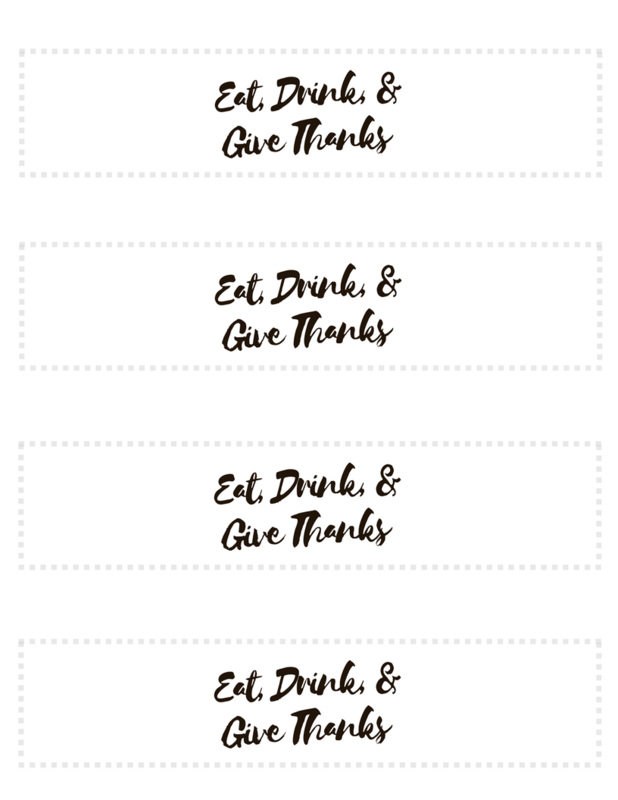 Plus, we’ve included a free DIY Napkin Ring Printable towards the end of this article to help impress your guests! Don’t wing a Thanksgiving gathering. Instead, put together a sound plan and write out a to-do list. Consider your cooking space and put together a menu that won’t overwhelm you or your kitchen. Don’t be afraid to ask your guests to bring dishes. 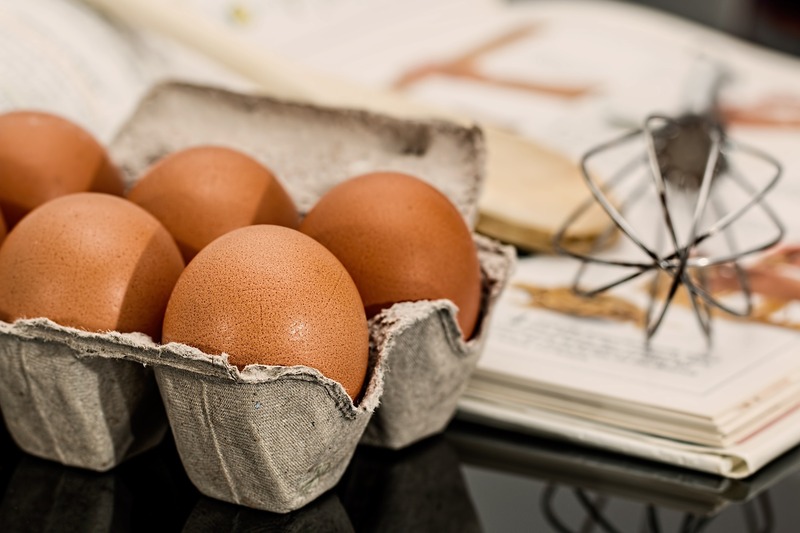 Plan with your family and friends on which specific foods they can make to help out. In addition, plan how you’ll serve dinner. Take inventory, and make a list of any additional plates, utensils, serving ware, chairs, etc. that you’ll need. SUGGESTION: Serve Dinner buffet style from your kitchen along with a separate drink station. For inspiration on how to set up a Thanksgiving buffet, head to Pinterest. Prep your home for guests by tidying up and rearranging furniture if necessary. Hosting dinner in a small space can get tricky, so try temporarily placing things you don’t need for the event in either your bedroom or closet. Also, gut out any expired items or food in the back of your refrigerator to make space for the turkey. Get rid of any clutter building up in your kitchen and dining area too. SUGGESTION: Shift your dining table to the center of the room or living room area and move your coffee table out. If you don’t have a dining table or your kitchen table is small, buy/borrow a folding table and folding chairs. You may even want to skip the big table altogether and have guests casually eat and mingle in the living area. Of course, you’ll also want to prep the food. Don’t leave all the cooking for the big day. Consider what can be made the night before. Remember, the turkey will most likely dominate the oven on the big day, so consider side dishes to prepare ahead or ones that can be created entirely on the stovetop. For side dishes that need to be made the day of, start as early as possible and don’t underestimate the recipe. It’s beneficial for you and your guests if you clean as you go. This applies to meal prep and the dinner itself. Clean up spills immediately and wash in between prepping. 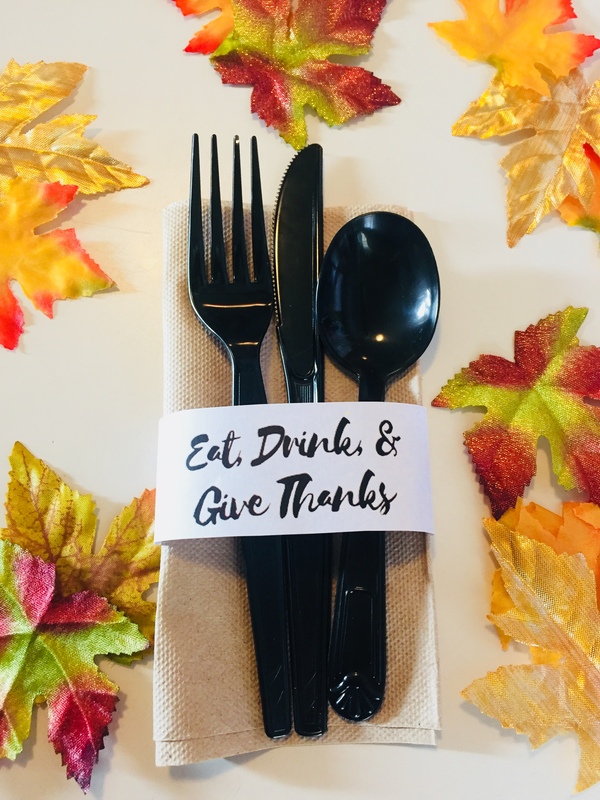 Merry Maids has an excellent post on Thanksgiving Clean As You Go Tips. Lastly, a great host will add flair to their dinner party. It doesn’t have to be over the top or complicated either. Try decorative candles, a centerpiece, table confetti, a wreath for your front door, etc. Get creative with a bit of inspirational help from Pinterest. 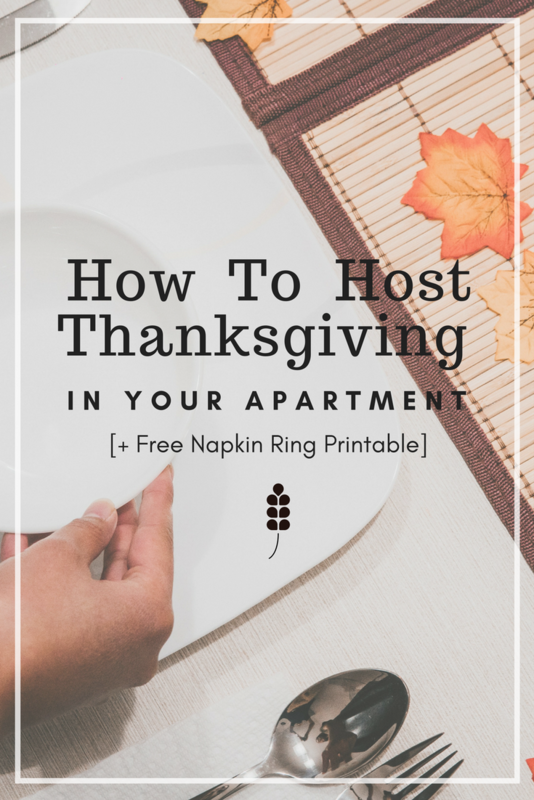 Something as simple as napkin rings can add the flair your apartment Thanksgiving deserves. Print out our DIY napkin rings below to get this look. All you need is paper, a printer, scissors, and tape. It’s that easy! SUGGESTION: There’s nothing wrong with disposable plates and utensils, they make for a simple cleanup. Get decorative disposables to give your dinner party charm. If you’re doing the apartment buffet, you can set up the utensil sets pictured above around the buffet table. Curl the cut design so that it resembles a ring, and use tape to hold together.